For quite some time, we’ve been warning small businesses and organizations to set up their own Google Analytics accounts, and not leave it in the hands of their website developer. The reason is that too many developers, not understanding the implications, will set up Google Analytics under their own developer account, and not in the name of their client. As a result, we’ve come across many businesses and organizations that don’t own their own data and are at the mercy of their developer. And there was no way to take back ownership of your data. 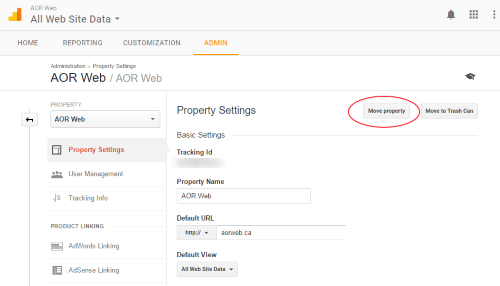 Google Analytics has finally introduced the ability to move properties to a new account. So now those small businesses and organizations can take back control of their data. To access this new feature, go into your admin, select the account with the property you want to move, and under the Property column, choose Property Settings. There is now a Move Property button. Simply click on that button, select the account you want it moved to, and that’s it. You now own your data again. But still, for those that want to move their property, there are some issues. First, in order to move a property, you need Mange Users and Edit permission for both the source and destination account. Unfortunately, we’ve seen situations where the development company not only owns the data in their own account, but refuses to even give these permissions. Second, even though the account has been moved, your tracking ID does not change. It will still retain the ID number for the old account. While this isn’t usually a big issue (except in some rare instances), it still looks a bit unusual to have someone else’s account number. But this is definitely a great move by Google, and we’ll be advising our clients that don’t own their data to immediately look at moving their properties over to their own accounts.